The Entente had made no shortage of promises as their soldiers had fought across the globe. The Russians had been promised Constantinople. The Italians had been promised chunks of the Austo-Hungarian Empire. The Japanese had been promised Germany’s Pacific territories. The Arabs had been promised independence. And the British and French had made promises between themselves to divide up the rest of their opponent’s colonial lands. That many of the promises contradicted themselves was hardly a matter – sorting out the various treaties was a concern for victors, not the vanquished. And the war appeared far from won. In three brief paragraphs, Britain set the road-map for an entirely different Middle East – and the conflicts that would define the next century. The concept of a Jewish homeland – a political goal of the Jewish movement of Zionism – had been debated for decades, if not nearly a century. For many of the Jewish leaders in Europe, the question was not if the Jews should settle into a nation state of their own, but where. The late 19th century had slowly begun to see progress towards Zionism’s central goal. Immigration reforms in Argentina and the Ottoman Empire had opened the doors to increased numbers of Jewish settlers, and coupled with the anti-Jewish Russian pogroms from 1881 to 1884, saw millions of European Jews feeling increasingly desperate to escape. Still, for the Jewish Colonization Association in Argentina and the New Yishuv in Ottoman Palestine, their goals were less independent Jewish states than autonomous collectives as both groups were not only settlers in foreign nations, but still minorities in their new lands. It was through the British Empire that the first serious discussions were held to establish an actual, independent Jewish-based nation. In 1903, British Colonial Secretary Joseph Chamberlain proposed to Theodore Herzl, the father of modern Zionism, to establish a Jewish state in British Uganda (now modern Kenya). Chamberlain offered Herzl 5,000 square miles (about 3,000 square miles smaller than the current size of Israel) on the Mau Plateau. The British offer was in direct response to repeated Russian pogroms, and with the Russians and British competing across the globe in their “great game,” the British offer could be seen as gaining influence with Russia’s still sizable Jewish population. The territory was an afterthought to London. Chamberlain literally had the idea as he took a train through the land, mistaking it for Uganda and not Kenya. What would be known as the “Uganda Scheme” won approval at the World Zionist Organization’s conference in 1903, but was hotly contested by both Russian delegates (who saw through to the political consequences of the British proposal) and those who believed that only Judism’s historical home in Palestine would suffice. For two years, the WZO studied the possibility of finally granting Jews a nation state of their own, but finally decided that the region was too hostile (the native Maasai had no interest in sharing their lands with Europeans) and too far from their goal of Palestine. Despite a number of delegates arguing that the body should accept the offer, the WZO turned down the “Uganda Scheme” in 1905. Zionism wanted Judism to return in strength to the Holy Lands of Palestine. And the Ottoman Empire was determined to never let that happen. Official Ottoman policy for centuries had been to block any sale of property to foreigners. Not until 1867, with the Empire desperately in need of funds, did the Turks partially relent. But for foreign Jews hoping to settle in the lands of their ancestors, Constantinople again sought to block them. Jews were allowed to immigrate to the Ottoman Empire – provided they settled outside of Palestine’s holiest cities. The Ottomans were well aware of Zionism’s desire to establish an independent nation for themselves in Palestine, and having lost other territories to Europeans, were prepared to do whatever was necessary to hold Palestine. Besides, most of the Jewish immigrants were Russians – the multi-century enemy of the Turks – while even the current Jewish inhabitants of Palestine had little use for their religious compatriots. 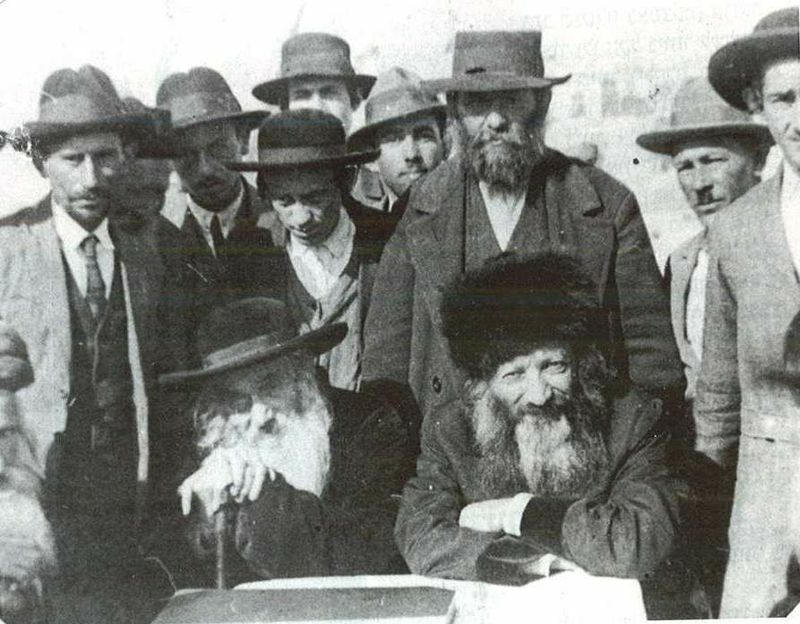 Most Jews already in Palestine (the old Yishuv, as they would be known), were deeply Orthodox while recent settlers (the new Yishuv) were often socialist and secular in their beliefs. The old Yishuv had more in common with the local Muslims than their fellow Hebrews. The Ottoman policies had weak points that the newly arrived Jewish immigrants quickly exploited. Ottoman policies prevented foreigners from buying land and Jews settling in the holiest cities in Palestine, but they didn’t prevent Jews living within the empire from buying from Muslim landowners. Most of Palestine was owned by a handful of families located in Syria – families that were overall far more secular than their fellow Palestinian Muslims and had no problem selling or renting to Jews. The Jews also were happy to buy lands outside of the holy cities – often in places that were barren, depopulated and otherwise worthless to their Ottoman owners. These land purchases infuriated local Muslims and the landless Bedouin, but Constantinople was unwilling to challenge the power of the Syrian landowners and block the transactions. By 1914, the Jewish population of Palestine was still small – anywhere from 3-10%, depending on the source. And war had changed Britain’s official position on the “sick man of Europe.” Where London had worked for decades to prop up the Ottomans as a check against Russian expansion into the Middle East, the war offered Britain the opportunity to seize territories for themselves. Prime Minister H.H. Asquith had favored maintaining Britain’s pre-war Ottoman policy, only slowly acquiescing to the Arab Bureau in support the Arab Revolt. But with Asquith out and David Lloyd George in, Britain’s focus was on driving the Turks out of the conflict. If supporting Zionist ambitions helped further that goal, London was prepared to pledge it’s support. As the war had raged on, and the Entente had begun dividing up the Ottoman Empire, the fate of Palestine had remained unclear. None of the warring parties had taken any interest in holding the international hot potato of Palestine’s post-war fate. The Sykes-Picot treaty had left the region as a vague “international zone,” with dim hopes that the Belgians, or later the Americans, might be induced to control Palestine. 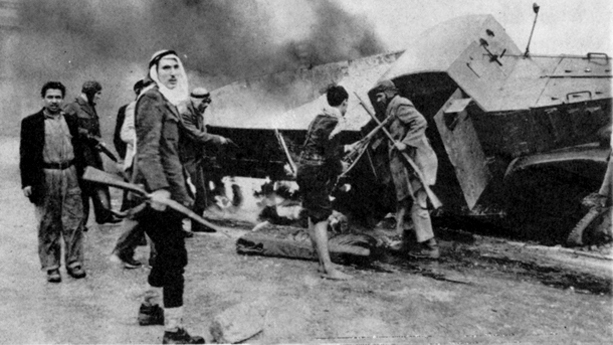 The conditions of the Arab Revolt had specifically left off Palestine as part of the free Arab territories, but without establishing claims by either France or Britain. To the early planners of the post-war world, Palestine was the land that time – and treaties – forgot. The change in government in London shifted British priorities. 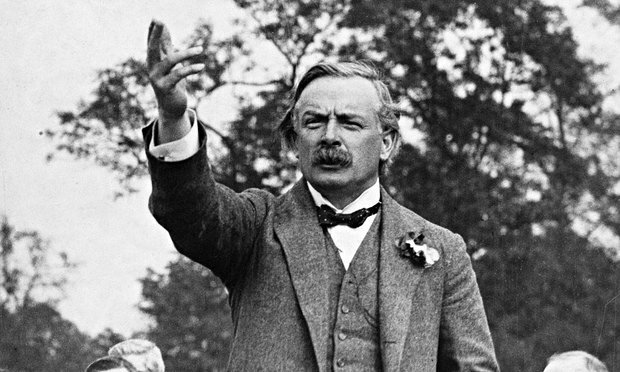 For David Lloyd George, once known as a “Little Englander” for his encouragement of self-determination in many British colonies, the new Prime Minister now sought an aggressive expansion of the Empire. With Zionism far more comfortable with British control of Palestine, believing that a post-war offer similar to the Uganda Scheme might arise under British occupation, George sought to tie Zionism’s goals to London’s. Others in the British government were less supportive. The myriad promises made by London in the region – to the French and to the Arabs – meant treading carefully about Palestine’s fate. The entrance of the United States to the war effort had complicated matters as well. The Entente had become the Allies, and the goals of territorial expansion were transforming into the rights of self-determination for various ethnic and national groups. Palestine was home to far more Muslims than Jews, so was encouraging Jewish settlement in Palestine a move in favor of the traditional colonial model? Or since the goal was the resettlement of a people whose generational roots were in Palestine in support of the newer model of small, ethnic states? London was as confused on the issue in 1917 as politicians would be in the decades that followed. London attempted to mediate the dilemma through various drafts of what would become known as the Balfour Declaration. 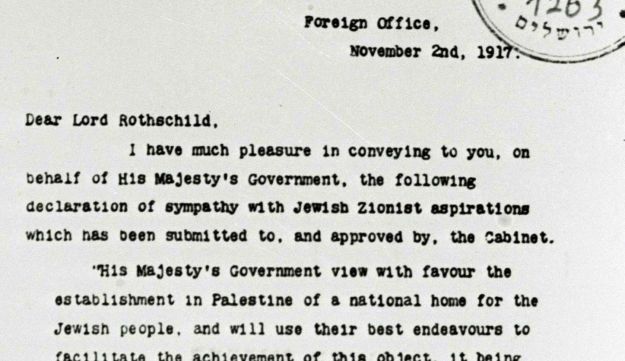 The document made it clear that London supported a “national home for the Jewish people” instead of a “state.” And London hoped that their language supporting “the civil and religious rights of existing non-Jewish communities in Palestine”, would mollify their Arab allies. The British believed they had made a small series of realistic promises to gain international Jewish support for London’s control of a post-war Palestine. Instead, they had opened a religious Pandora’s Box. The immediate reaction of Jews around the world was one of outright rejoicing. For the first time in history, a world power had staked a position in defense of Judism and in favor of Zionism. British Jewish leaders, who had pushed for British support for decades, had laid out three likely consequences of any such declaration: 1) Russia would continue the war, as Jewish leaders had played prominent roles in the original February Revolution; 2) American Jews would encourage greater U.S. support for the war effort and 3) German Jews would turn on Kaiser Wilhelm II. The prospects of such reactions had, in part, propelled London towards the declaration. Almost none of the hoped-for reactions came to pass. Those Jews active in the Russian Revolution saw themselves as socialists or revolutionaries first, and Jews second. The war had so crippled Russia that meager promises of a Jewish Palestine hardly factored into any consideration to stay in the war. American Jews did support the U.S. war effort, but there’s little evidence the Balfour Declaration had any impact on American Jewish efforts. Only American Jewish support of Zionism itself increased, with membership in Zionist societies increasing from 7,500 in 1914 to 149,000 by 1919. Leaflets on the Balfour Declaration were dropped in Germany and Austria, but garnered little reaction. The Balfour Declaration might have appeared as a godsend to the Central Powers as they looked to shore up the failing Ottoman Empire, but Berlin and Vienna had to tread carefully with respect to their large Jewish populations. Both the Germans and Austrians pledged to their Jewish citizens that their respective governments would lean on the Turks after the war to make a Jewish Palestine a reality. Even the Ottomans would go as far as to publicly state that “all justifiable wishes of the Jews in Palestine would be able to find their fulfilment [sic]” under Ottoman rule. After nearly centuries of opposition or disinterest, no power wished to be seen as against the return of Jews to Palestine. 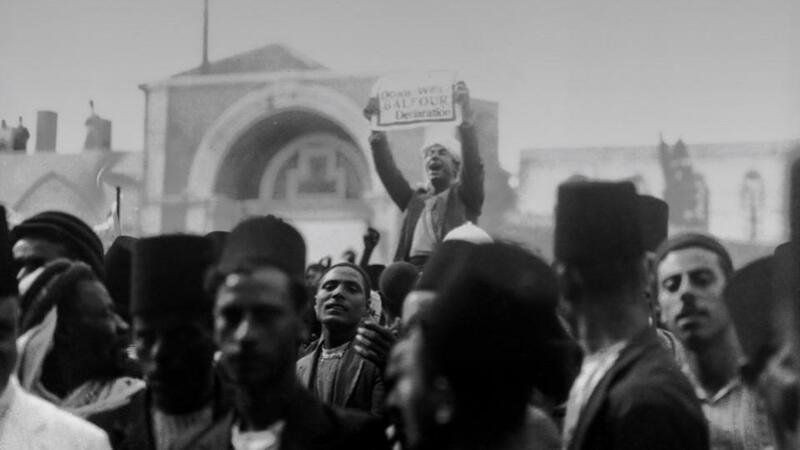 Riots would break out repeatedly during the 1920s as Muslims fought against Jews and the local British authorities, with no fewer than 38 major riots during the inter-war period. It is not spoken about much these days, but many European nations — especially Poland & the Baltic states — had darker motives for supporting hte creation of Jewish Palestine. They wanted to export their native Jewish populations to Palestine, lock, stock, and barrel. To be truthful, many of the leaders of the Jewish communities in these nations wanted this as well. Out of the peace following World War One there came the idea that the way to permanent peace in Europe was national self-determinition, with “nation” having the old meaning of a people with a shared history, territory, and language. The soveregn nations that were created out of the ashes of Empire did not want to host a foreign nation called Jewry. My source for this is Timothy Snyder’s Black Earth: The Holocaust as History and Warning (2015) and Bloodlands: Europe Between Hitler and Stalin (2010), and especially Hillaire Belloc’s The Jews (1922).